Two fundamental lines of work converge in the art of Andreas Fogarasi (Vienna, 1977): a reflection on the role that architecture plays in our society, as a lure to draw tourists and investors, and, in a more minimal vein, an emphasis on the importance of materials, structures and design. Having studied both architecture and fine art, he unites these interests to produce works that are sculptural in appearance and highly documentary in content, using them to analyse how things are presented to us and how culture influences urban development. Fogarasi’s rise to artistic prominence has been meteoric. In 2007 he represented Hungary at the Venice Biennale, where he won the Golden Lion for best pavilion with his video project Kultur und Freizeit about the different purposes for which various Budapest cultural centres have been used. 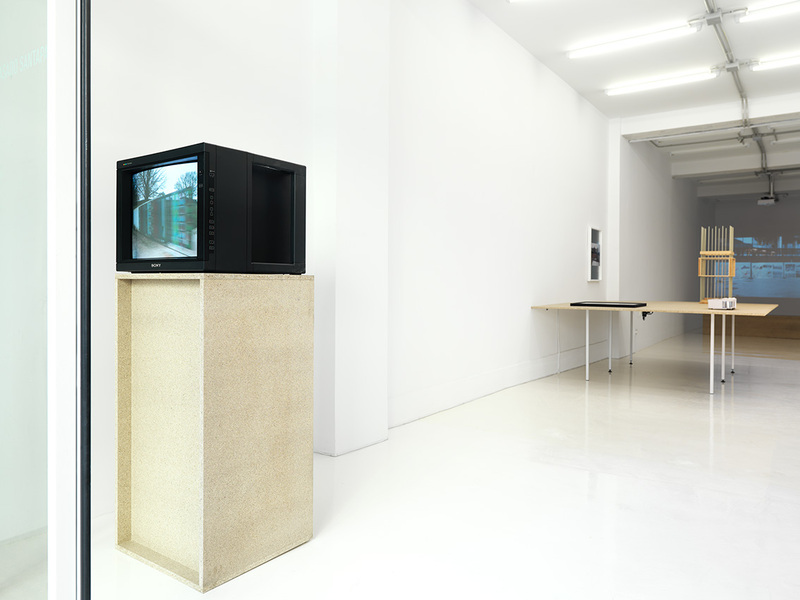 The videos were shown inside six semi-theatrical devices or “black boxes” resembling minimalist objects. In addition to filming the buildings, between shots the camera zoomed in on details of the walls, facades and other surfaces. The project now presented at the Casado Santapau Gallery focuses on the video oeuvre of this artist who, though no stranger to installation, sculpture, photography and writing, admits that this is the medium in which he feels most comfortable. When working with video, he does everything himself, from research and filming to editing, and he chooses to exhibit his creations in a highly sculptural way. In Fogarasi’s opinion, “videos are not about time but about space” and, as we see in Kultur und Freizeit, all of them are designed to be presented in a very specific, clearly-defined format, which is why he never sends them to festivals. 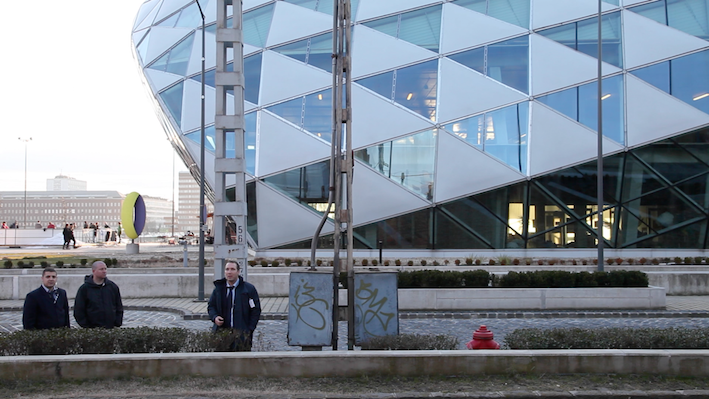 The videos selected for this exhibition—Kinetic Gate, Surface Studies – Karlsplatz and Budapest—were produced at different moments in his career. The oldest of the three, Kinetic Gate (1999-2012), features a functioning design by the Hungarian artist Victor Vasarely, father of Op Art and a central figure in several of Fogarasi’s projects. The other two videos are shot in a documentary style and pay close attention to architectural structures and details of building materials. Surface Studies – Karlsplatz (2007) sketches a portrait of the city of Vienna and its inhabitants based on the different paving materials used around the square named in the title. It is accompanied by another work on paper that captures the texture of surfaces in two Los Angeles buildings using frottage. This piece is part of a series entitled Donor Recognition Structures (2006), in which donor plaques at the Walt Disney Concert Hall and the Museum of Contemporary Art, Los Angeles, provide a pretext for investigating the institutional use of art and culture. The third and most recent video, created specifically for this show, is Budapest (2015). 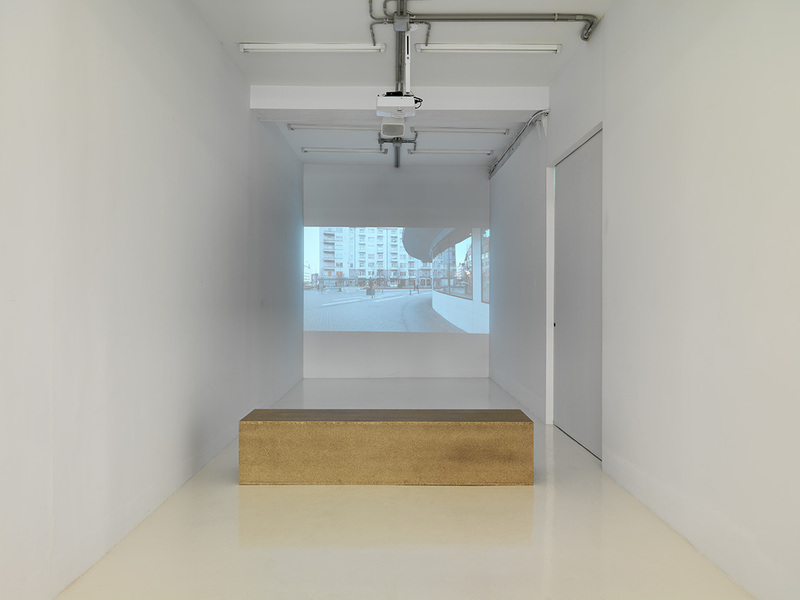 In it, the artist immortalises the materiality of a city that many people are being forced to leave due to the recession by filming new buildings, places of transit and other urban environments. He uses architecture to freeze time and document a social reality. This project was preceded by Mirror (Móricz Zsigmond körtér, Budapest) (2013) and other works in a photographic series which focused on developing areas in that same city. Fogarasi always takes photographs when he travels, planning out his route in advance with the help of guides specialised in architecture. Sometimes he snaps close-ups of well-known buildings, and at other times his subjects are ephemeral structures like fair booths and displays. A case in point is Togliatti Poster Stand (DIN A4) (2005), a billboard he stumbled across in that Russian city and recreated in his studio with a model, carefully measured to ensure that the advertising space would be the exact size of an A4 sheet of paper. 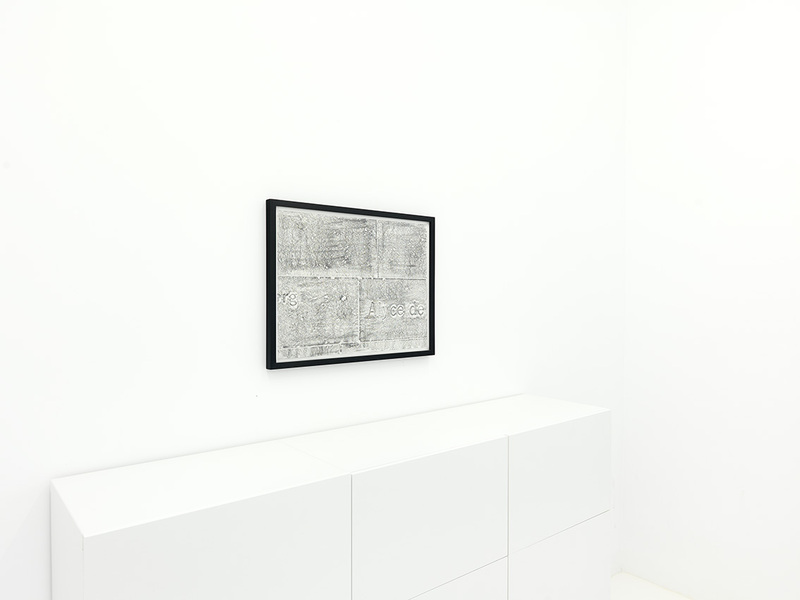 Anyone familiar with his work and the importance he attaches to the mise en scène knows that Andreas Fogarasi’s pieces and exhibitions have to be experienced in person. In Madrid, he will transform the white cube of the new space at the Casado Santapau Gallery into a place where projections dialogue with objects placed on rough wooden furniture. Almost simultaneously, at tranzit.ro/ (Iasi, Romania) and amt-project (Bratislava) he will present Installation and Photography, two solo exhibitions which, like Video, allow the artist to reflect on the media with which he works. * This text is based on a conversation held with the artist in Vienna in October 2014, published in DARDOmagazine #26, 2015, pp. 62 – 77. Calle Piamonte, 10, 28004 Madrid.